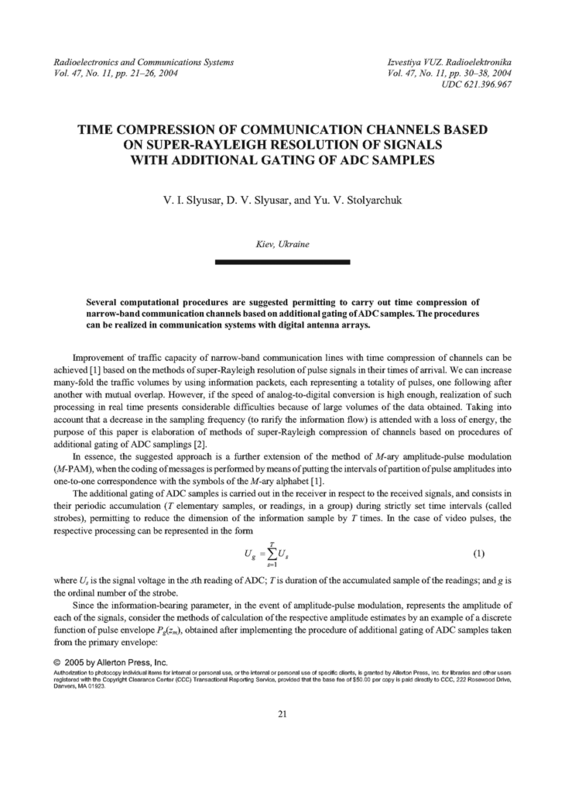 Several computational procedures are suggested permitting to carry out time compression of narrow-band communication channels based on additional gating of ADC samples. The procedures can be realized in communication systems with digital antenna arrays. SLUSAR, V.I. ; UTKIN, Yu.V. "Communication channels multiplexing on the basis of superrayleigh signals resolution with respect to arrival time," Izv. VUZ. Radioelektronika, v.46, n.5, p.40-48, 2003. SLUSAR, V.I. "Synthesis of algorithms of measuring M sources distance in additional strobing of analog-to digital conversion readings," Izv. VUZ. Radioelektronika, v.39, n.5, p.55-62, 1996. SKLYAR, Bernard. Digital Communications: Fundamentals and Applications, 2nd ed. New Jersey: Prentice-Hall, 2001.